HaRav Bentzion Mutzafi, a prominent Sephardi posek in Eretz Yisrael, explained on Sunday, 27 Sivan that due to the many tragedies that have occurred, parents should not permit their children to play on bicycles. The rav was recently asked by a talmid, who spoke of the 7-year-old boy from a Southern Hebron Hills community, who died as a result of a bicycle accident this past erev Shabbos. At the end of his response, the rav told talmidim “Parents, do not give them bicycles. Have rachmanus on us”. The psak does not make particular mention of electric bicycles and the small boy who died R”L was riding a regular, non-electric bicycle. Hence, it is believed the rav’s psak pertains to all bicycles. HaGaon HaRav Yitzchak Zilberstein Shlita, the Rov of the Ramat Elchanan neighborhood of Bnei Brak and a member of the Degel Hatorah Moetzas Gedolei Hatorah, also released a psak. “Parents who give into children and buy them an electric bicycle are viewed as partners in murder and they will be liable for this if chalila something occurs”. Incredible that little kids ride bikes in the street. For them to cross the street too is dangerous (alone). Common sense safety precautions that every standard American knows are still unknown to foreigners, chassidim, and many yeshivish as well. But I’ll bet they wouldn’t dare eat lox and cream cheese because of sakunu. More people in israel die from car accidents daily then kids riding a regular 2 wheel bicycle. Give them smartphones instead? Or even better, send them out to stand in middle of the highway to block traffic in protests. i am not familiar with the details of the bike tragedies in Israel so I have to wonder what this Psak is all about. There are various proven safety precautions that one can take to drastically improve bike safety. First and foremost is to always where a bicycle helmet. Second wear clothing that makes you more visible to motor vehicles especially at night. Make sure you have adequate lighting on your bike for night riding. Make sure you ride safely and not recklessly. With the appropriate safety measures biking is a very healthy activity that is good for exercise, recreation, and for getting around such as to and from work and school. The word ‘Psak’ is very vague nowadays, it’s closer to advice. Let the statistics do the talking. On average 15 cyclists die a year in Israel while 370 die in car accidents. When is the car ban coming? If it’s about electric bikes, I totally understand! A few years ago I was hit by a 14 yr old driving one really fast on the sidewalk in Yerushalayim. He plowed straight into my back at full speed and knocked me to the ground. Luckily I ended up with just a few cuts and scrapes and some torn clothing. I say luckily because I was 18 yrs old, if the kid has hit an old person, the hit and fall could’ve easily caused serious injury. I would say electric bikes should be completely off limits for kids. How about encouraging his followers to always wear a helmet. Seems he’s overreacting to a tragedy without really doing a thorough analysis. However, after reading his psak in Hebrew I’m very impressed with the progressiveness of this line regarding these tragedies. msl613. Of one jumps off a 10 story building and dies, is that death mishamayim or caused by the jumper? I think that’s what he means, although I don’t agree with his view regarding the realities of the dangers of riding bikes. I think parents let their kids ride dangerously without educating them properly on the dangers. But it’s not a psik reisha like jumping off a tall building. Why are some comments trying to compare cars droven by (hopefully) grown up adults to the situation here of small children driving bikes while being careless and wild as is their nature at that age??? No one is saying it is asur for an adult to drive a bike to/from work or just for fun. Adults usually ware helmets and are generally cautious when bike riding, just as they (usually) are when car driving. The talk here is about banning bikes from small children, as their nature is to be wild and careless, especially when they are together with friends, and therefore there is unfortunately a lot of accidents of kids with bikes on a daily basis, such as flying into a gate and losing a tooth or 2, sudden sharp turns ending up being tumbled over on the ground etc. etc. etc. My Rebbe the older brother of the 2 Vizhnitser Rebbe’s in bnei Brak banned kids from bikes over a year ago, and slowly I see other Gedolim are starting to follow suit. Thank god for planting gedolim that guide us on every step of our lives, including a bike issue with kids. Thats what our Rebbe’s/Rabbonim/Rashei Yeshivos are here for, not just when we need a yeshua. First and foremost they are here to guide us in life!!!!! This psak disturbs me . It’s clear that either the youth was negligent or someone else was . So we got us a new fatwa here, no bikes, what else should we stop doing? I think kids should simply be locked up their home all day because they are so wild and dangerous to themselves and the public. Sending them to school is simply out of the question, they are just to wild and dangerous and is a tremendous liablity to any school and thier staff. They should all be home schooled. There’s no such thing as road safety education here unfortunately. Well, actually there is, but only for the non-chareidim. The Charedim tend to reject that kind of thing because it comes from the local authority. If you look at the dangerous and illegal way many parents cross the road with their children, it’s hardly surprising that children don’t know how to be careful on bicycles. There is unfortunately an almost complete disregard of road safety because as ‘it’s not Torah’. In fact the Steipler, amongst others, held that keeping to the rules of the road is an obligation. When will we learn not throw-out the wheat with the chaff? the truth of the matter is that many many years ago when my boys were young they wanted bicycles and I spoke to a rav that I was friendly with and he advised me to buy them other toys that keep them off the streets but not bikes. 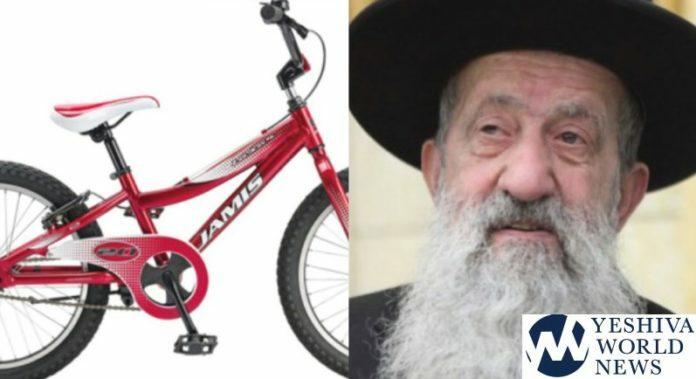 I followed his advice and my kids did not get bikes until they were already in Yeshiva and earned money to buy them themselves for going to yeshiva. All my boys are today shomer mitzvos – B”H that I listened to that rav…. Rebbe Yid, thank you so much for enlighting us foreigners, chassidim, and many yeshivish as well. It’s great to finally be out of the dark ages. And by the way, gevald! you eat Lox and cream cheese?